TERRERO -- Visitors to Pecos Canyon this Memorial Day weekend will notice some improvements to fishing and camping areas that will make their outdoor experience cleaner and more comfortable. This week, the Department of Game and Fish put the finishing touches on improvements to two popular fishing and camping access points along the Pecos River. Roads were graded, campsites were improved, bear-proof trash bins were installed and state-of-the-art vault toilets were built at the Bert Clancy and Terrero areas. The Department hired an employee to remove trash and perform maintenance on several properties between Pecos and Cowles owned by the State Game Commission. A volunteer also will help with trash cleanup. Management of the properties eventually may be turned over the State Parks Division, as suggested by the 2010 State Legislature in a House Joint Memorial. This year’s improvements were focused on the Bert Clancy and Terrero areas. 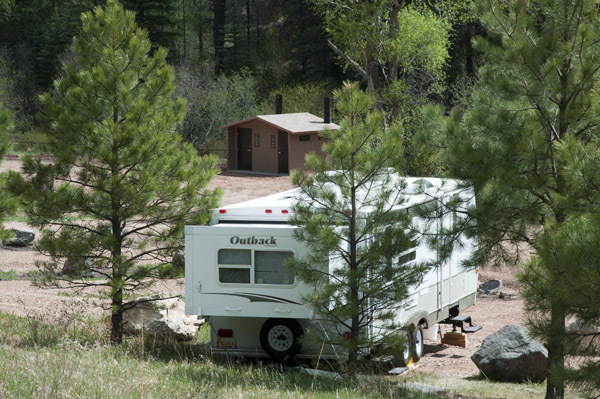 Future work is planned at the Mora campground and Jamie Koch recreation area. At the Bert Clancy area, Department crews defined nine RV campsites with large boulders, spread 2,000 tons of base course on pads and access roads, and installed 3,000 feet of pipe fencing to keep vehicles out of the river. Bear-proof trash bins were installed, and a large vault toilet with separate facilities for men and women is one of the best in the canyon. The Terrero site, one of the most popular in the canyon, was improved with trash bins and a new vault toilet. The access road over runoff from a natural spring was improved with about 300 tons of rock and 150 tons of base course. All Commission-owned properties in the canyon are part of the Gaining Access Into Nature (GAIN) program. Visitors ages 18 or older must have either a GAIN permit or a current hunting or fishing license, and a Habitat Management and Access Validation. Licenses and permits are available at license vendors statewide, online at www.wildlife.state.nm.us, and at Department offices in Santa Fe, Albuquerque, Raton, Roswell and Las Cruces.